Everyone loves chili, especially as it gets colder. 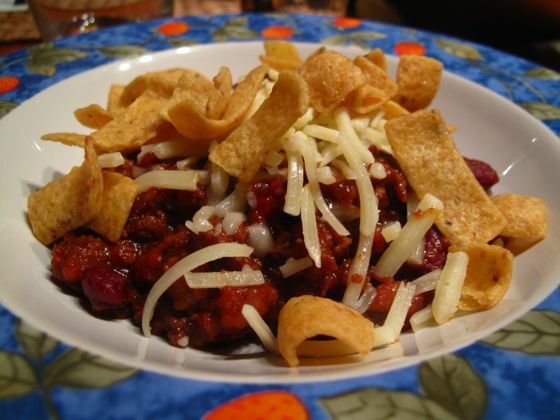 This is an evolving recipe that is the basis for a “chili bar” – a party favorite in which people can assemble their own chili bowl. I put a few ingredients around the completed crock pot: finely shredded cheddar cheese, sour cream, chives, onions, and the foundation: Fritos. Regular or Scoops work equally well. Brown the meat & onions and drain, lightly sauté the veggies, and add these into a large crock pot with all canned goods and spices. Cook on high for 4 hours, then low for 2 hours. Done!